Donald Lambert was one of the greatest musicians ever to come from Princeton. In the late 1920s, he was a well-known jazz pianist in New York City, playing at nightclubs and other venues. However, in the 1930s he retreated from public view, preferring to play at smaller clubs in New Jersey, and stayed out of the limelight. Breaking his silence, in 1941 he recorded a number of solos for the recording company Bluebird. He made a few other private recordings that were released after his death in 1962 by Solo Art, IAJRC, and Pumpkin, but for the most part he remained unknown outside the local area. While only a few examples of his playing exist, it displays a unique technique that sets him apart from other pianists of his time. Very little is known about his personal life, but one fact we do know is that his mother taught him how to play music but not how to read sheet music, so he either improvised all his music or played by ear. He participated in a popular form of musical competition at the time, “cutting contests”, which involved piano players each taking turns trying to make a simple melody faster, more complicated, and exciting. Lambert was a master at these, and won many with his rapid left hand striding technique, and became well-known in the jazz community in the Bronx for this rare skill, earning the nicknames of “Jersey Rocket”, “The Lamb”, “Muffin”, and “The Lamb of God”. 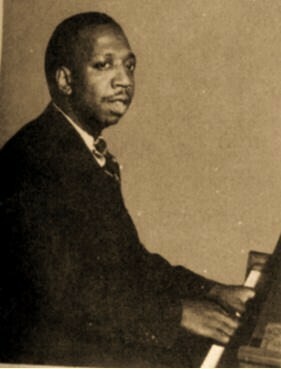 In one of his most famous moments, he challenged famous improv pianist Art Tatum to a piano contest at a concert. Other than this, most details of his life remain shrouded in secrecy.